I used to love Facebook. I was in law school at Wisconsin when it launched, and everyone I knew on the site was basically a peer -- people who I'd known well or at least met in person at some point. Then... I graduated. Suddenly having a Facebook account full of pictures from blurry nights in Madison and Pulitzer Prize-caliber dirty jokes from my friends wasn't so awesome anymore -- especially once I started working for Engadget and lots and lots of people I didn't actually know (or, somewhat even worse, only knew professionally) started looking at my personal page. So I needed a system -- a way to still use Facebook to share personal stuff with friends, professional stuff with colleagues, and awesome stuff with everyone, all without blurring any lines or accidentally sharing too much with people I don't know. 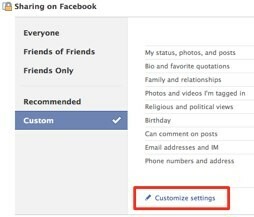 Luckily, it's not so hard to do -- you just have to make effective use of a Facebook feature called Lists. By grouping all your friends into lists you can make sure you're sharing the right information with the right people -- pictures from last night's epic party with your actual friends, sanitized vacation photos with co-workers, almost nothing with strangers. But just making a bunch of random lists won't work -- you need a plan, and we've got one for you that involves making just three lists to solve all your Facebook privacy worries. How? Read on for step-by-step instructions. Step one is the easiest step -- you just need to make the lists. Don't worry about putting people in them yet, we'll do that in a later step. To make a list, first hit the Account menu in the upper right, and select "Edit Friends" as shown above. Hit Create New List, and the list editor will pop up. 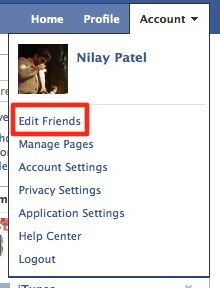 Don't worry about selecting friends in this window, just type in a list name and hit Create List. People I trust: These are your main dudes and ladies, your closest friends. You're only going to put 10-15 people on this one, max. My friend Will's version of this list is named Inner Circle; mine is named True Blue. It's the VIP list, so treat it accordingly -- people have to earn their spots. People I don't know well: Virtually everyone else you know goes on this list. It's the one for friends from class, or the people you only see at parties, or friends of friends. Remember, you really don't know that many people well -- anyone you wouldn't trust to keep those pictures of you on spring break in Mexico under wraps while you run for Congress goes on this list. Limited Profile: This is everyone you probably have to be friends with but that you don't really want seeing your profile. Your boss, your little cousin, your mother. You're going to lock this list down tight. That's it -- those are the only three lists you really need to make. You can also make one for Family and possibly one for Work Friends -- I have an Engadget list -- but any more than that just needlessly complicates things, and you want to keep this as simple as possible. So now that you have your lists in hand, you have to go set them up. 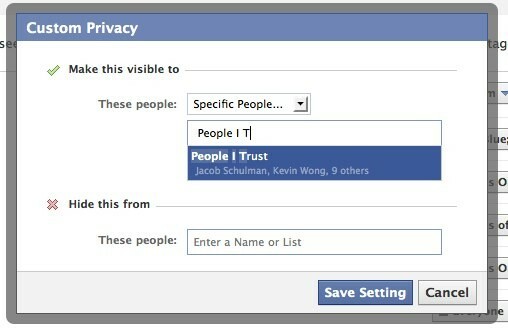 Go back up to the Accounts menu in the upper right and hit "Privacy Settings." 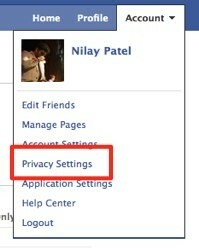 That'll take you to the Privacy screen, where you want to hit "Customize Settings" at the bottom. Edit Album privacy: Make sure you go through this when you're done -- it's a big one. That's easy enough -- the real key is to limit photos and videos you're tagged in to the People I Trust list -- but we're not done yet. Go back up and hit "Edit album privacy" under Birthday to make sure only the right people are seeing the snapshots of your past. This one's totally on you -- you have to decide which of your albums you're going to share with what list -- but every photo album you've made should be assigned to a list, not just freely available to everyone or friends of friends. Trust us on this one -- it's easy enough to add someone to a list or to an album if they need access for some reason. Okay, so now you've assigned all your content to lists. Now it's time to organize your friends. This is the fun part -- hit Edit Friends under the account menu again, click "Friends" under Lists on the left side, and you'll get a long list of all your friends. 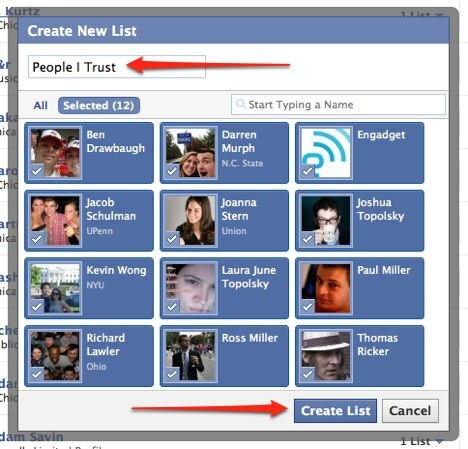 All you've got to do is drill through, delete all the people you don't know or don't remember by hitting the X on the far right side, and assign everyone else to a list by clicking on the drop down and picking the appropriate category: People I Trust, People I don't know very well, or Limited Profile. You'll be surprised at how easy it is to filter your social network into these categories -- they mirror your actual relationships with people, after all. Just remember: everyone should be on a list! This system doesn't work at all if you don't put everyone on a list -- after this big initial sorting, just add people to lists as you add friends -- it's super easy to do. That's easy enough -- and remember, you can always move people between lists, just like friends move between roles in your actual life. Yes, it's a little uncomfortable to think about relationships like this, but it'll be even worse if your boss finds that FurryCon '07 album one day -- and once you've got things set up the first time, it only takes a little maintenance to keep up. Facebook doesn't have to be terrifying, people -- get out there and make some lists. P.S. Oh, while we're at it, make sure you hit up Engadget's official Facebook page -- you can also find me and Josh Topolsky if you like.